It was on this day in 1999 that the first major Star Trek celebrity passed away. DeForest Kelley, who portrayed Dr. Leonard "Bones" McCoy, was born in Atlanta, Georgia. Although no longer with us, Kelley helped create the global sensation Star Trek, which continues to entertain and garner fans as strong as ever, even in Atlanta. Dragon*Con is "the largest multi-media, popular culture convention focusing on science fiction and fantasy, gaming, comics, literature, art, music, and film in the universe!" The convention, which drew 40,000-50,000 people last year, regularly features Starfleet uniform-clad fans, as well as costumes of numerous other species from around the galaxy. 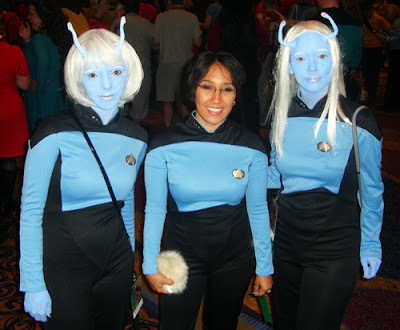 In this photo, taken at Dragon*Con 2010, is a human flanked by Andorians, all wearing the same blue Starfleet uniform worn by Dr. McCoy. Blue indicated that the person wearing it works in the Sciences, in McCoy's case, medicine.